Hello everyone! How are y'all doing? Has this been the longest week ever for you too? Seriously, how is it not Friday yet. Well on the bright side, I have another great post for you! Today I have three products to review from the Born Pretty Store. Enjoy! The first product is a continuous pattern Quirky Arabesque stamping plate. These patterns are really beautiful and so my style. I was able to get some good results from most of this plate. Some areas of the plate however were harder to stamp than others, mostly along the edges. The plate is not very deeply etched, so it requires a light hand. Hello lovelies! I was in a race against myself to see how quickly I could do this mani and get the post finished. I had a plan to go to the gym that I don't want to give up on. It takes me a long time to do my posts typically, so I didn't think I would have time. I really wanted to try this mani for today's Challenge prompt though, so I thought I would give it a try. 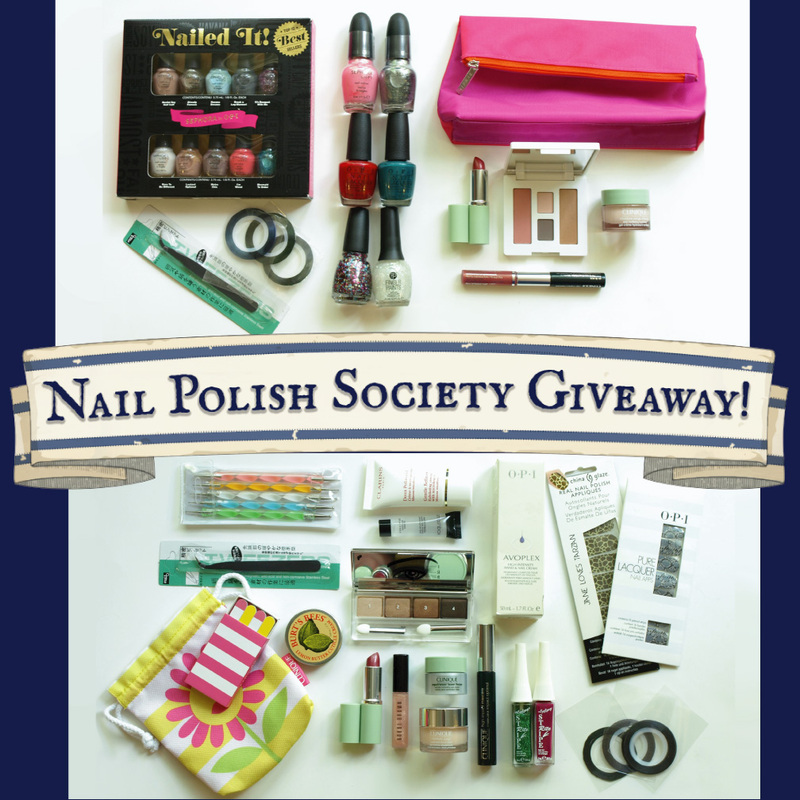 Announcing the winners of the Nail Polish Society One Year Blogiversary Giveaway... Amy F. and Aarone M.!! Congratulations ladies! Both winners have responded to me, and I will be shipping out the prizes soon. Thanks to all who entered. I appreciate each and every one of you! My readers are the bestest :D. I don't have another giveaway planned yet, but I love doing them so I'm sure it won't be too long. In the meantime, I have more awesomeness up my sleeve, so stick around! Many of you may recognize this mani as a recreation of Paulina Passion's Nautical Rose Nails. She did them back in February, and they're still one of my favorites of hers. I fell in love the instant I saw them. I've been wanting to try them ever since. I don't typically copycat manis so closely. But with this one I wanted to get as close to original design as I could manage. Today is a little bittersweet. I'm sad that my guest post series is over after today, but so thrilled to present my final one! 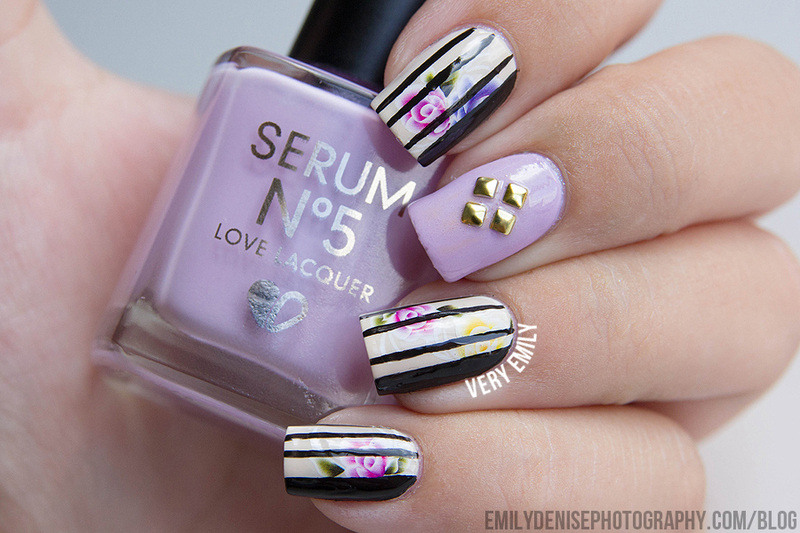 The very talented Emily from Very Emily is gracing the blog with her presence with a beautiful mani. Not only is Emily a talented nail artist and swatcher, but she is super sweet too! I was so thrilled to discover her blog a few months ago. And since then I've been impressed by how well she interacts with her readers. Every time I've left a comment, Emily has responded with a thoughtful message. She is my shining example to do better at this myself. I'm trying, I promise! Now let's take a look..
Hi everyone! I'm Emily from the blog Very Emily and I'll be guest posting on Nail Polish Society today. I was so honoured when Emiline asked me to guest post for her to celebrate her 1 year blogiversary. I simply couldn't refuse! I want to congratulate her again on this awesome milestone and hope she'll be around for many more years as I love her work! I came up with this fun and easy floral print for this guest post. I used floral water decals for this manicure as it would break my heart to paint over freehanded florals. :D Don't you agree ladies?! And I was also looking for fun way to use them that is just a little different or more unique than just placing them on top of a solid colour. I really like how it came out! Hello everyone! Today I have a review of two Colores de Carol polishes from the new collection, which are all jewel toned. Colores de Carol is an indie brand that I've been curious about for quite a long time, so I was really looking forward to trying these out! Colores de Carol polishes are all 5-free (meaning no Formaldehyde, Toluene, DBP, Formaldehyde Resin, Camphor). Both brushes were medium sized, with flexible and even brushes. Both polishes are linear holographics which I don't have much experience with. I actually only have one other (it's a China Glaze) that is quite difficult to apply, so that's all I have to compare to. The consistency of both are jelly-like, what I think of as "syrupy". At first I was afraid that this would make application difficult but didn't find that to be the case. I applied them avoiding going over the same spots more than once or twice. In two coats I had even coverage with both shades. Amethyst is described as a "linear holographic medium purple with blue shimmer". In direct sunlight the blue shimmer isn't very noticeable amid the holo sparkle, but is a little more visible in the shade. This is two thin coats, plus topcoat. For today's Challenge prompt I have a fun watermelon mani! There are so many cute ones out there already, so I tried to create something with a different spin. I have a tutorial in the works that will be ready soon, so keep your eye out for that. Hello there Pretty Peeps! I am thrilled to introduce today's guest blogger, Lucy of the Snail Nail. 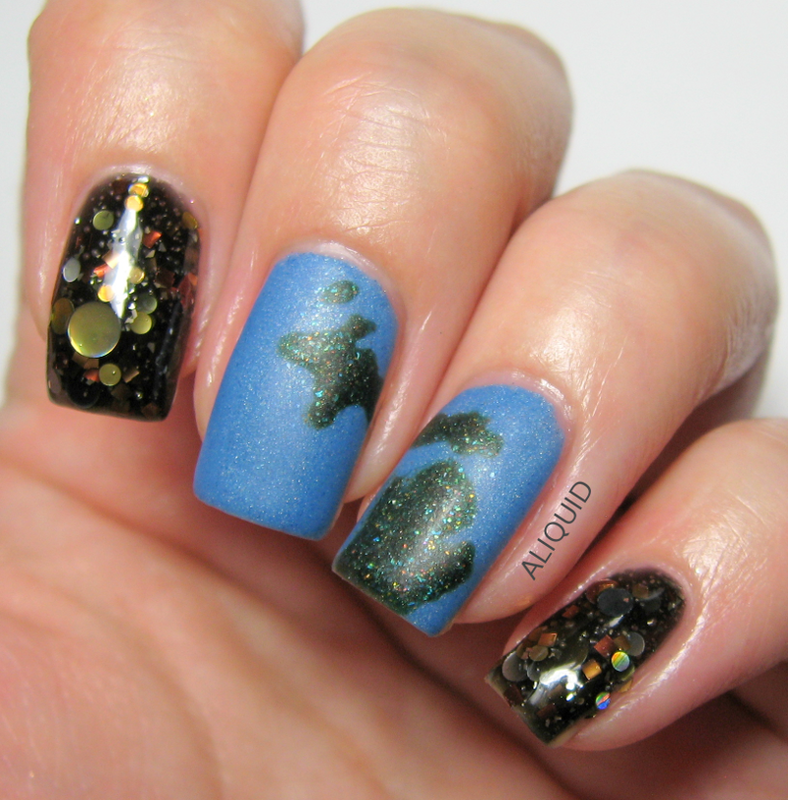 I am a big fan of her nail art and am so glad to have her on Nail Polish Society! Speaking of, I believe I discovered her blog because the name is basically the same as one I was considering for my blog- Snail Nail. You may remember me mentioning that I am a snail mail fanatic and that I've been pen palling for years. The inspiration for her blog name was completely different, and I love it (read about it here)! Anyway I'm so glad I stumbled upon it as I've been inspired by many of her manicures. I hope you get inspired too. Like many nail artists, I follow WAH Nails on Instagram. Today's design is a sort of recreation of a design they posted awhile ago, with some changes (it's been in my inspiration folder since I started blogging!). I have another Challenge post for you today. To be honest I didn't really have a plan for this manicure. I mean, it's supposed to be abstract, so what's the point of planning it? Well I did have the end result in mind, I just didn't plan on how to do it. So as it started straying from that image I just went with it. And this is how it ended up. Happy Monday to all my wonderful Society Sisters! Today I am thrilled to have Jacqui of Craftynail on the blog! She was the first blogger to reach out to me, which instantly made her somewhat of a kindred spirit for me. I was a little shy in the first few months of my blogging journey and she helped me break out of my shell. I did a guest post for Jacqui back in December where I explained a little bit about the origin of my blog name. For my blogiversary celebration I asked her if she would return the favor, because well, she owed me one. Kidding! :) If you haven't experienced Craftynail yet, I highly recommend you give it a visit. I always look forward to the variety of posts she has, with a fun peppering of humor that make them a joy to read. It's not just for the pictures kids! Let's read, shall we? Oh hai! My name is Jacqui and I run a U.S. nail blog called craftynail.com. I'm so happy to do a guest post for Nail Polish Society, know why? Emiline's was the first and only blog that I've asked to do a guest post for me over at craftynail (here it is if you'd like to see it). I love how karma works out like that. For today's post I'd like to talk about AVON for a bit. I read alot of nail blogs and I've noticed that not a lot of girls post about AVON. Not sure why. But personally, I'm a huge fan of AVON nail polishes! I think I own more AVON than any other brand of nail polish (Zoya is a close second). For fun, I'd like to show you my avon stash. It's weird, once I put them all together though it doesn't really look like a lot! Hello lovelies! I am so excited about today's guest post! Hannah of The Dalai Lama's Nails is joining us for my Blogiversary Celebration guest post series today. I started following Hannah a few months ago because I was so inspired by her creativity. I love the designs she creates with her freehand nail art. Though it was hard to choose, I have some great examples to check out here, here, and here. I'm also a fan of her blog name and the inspiration behind it. It's genuinely original. But before you get too distracted by checking out her awesome blog, let's see what she has for us here! Hey there, I'm Hannah, and my little corner of the blogosphere is over at The Dalai Lama's Nails. Something I love about blogging is that I get to know other bloggers - and that's how I've started to get to know Emily. I'm always so inspired by her work - she's got such a wonderful sense of design and color. Plus, oh my gosh, I so identify with her ideal Polish Society. I believe in my right to bear polish! I can't believe she's only been blogging for a year - she's so good! (and congrats, dear!). For my guest post today, I was so inspired by her Wild Zebra Hearts Tutorial. Because - duh - how freaking cute are those hearts?! I decided to go with two contrasting colors, and to add in a full zebra stripe accent nail. Hope you like it and try out her tutorial for a fun and easy look. Happy Friday everyone! How's your week been? Mine has been pretty darn great. My husband got a new job and we're both stoked about it. He should be much happier there. I've been having a great week here at Nail Polish Society too. I'm loving the guest posts (here and here) and I have another one for you tomorrow! Today I have a simple and sweet dotticure for the Oh Mon Dieu Challenge. I haven't been able to keep up with it every day because of my blogiversary celebration, but I'm joining in when I can. Last month I swatched Renaissance Cosmetic's new Emerald Envy, and I promised you two more. I didn't plan on taking this long, but better late than never! The polishes I have today are truly stunning. I am in love! Just like Emerald Envy, both are very unique to my collection. Let's take a moment to gaze upon their beauty, shall we? Enamoured is from Renaissance Cosmetics' new Wunderkammer Collection and is quite complex. It's described as "a deep purple creme/jelly with a vibrant fuchsia-gold shimmer, holographic micro-glitter, and blue iridescent flakes." Pretty amazing, right? What makes this so gorgeous is the rich vampy color, yet it's still vibrant at the same time. Even at night it glows and sparkles as you can see in this Instagram photo. Shown here is two semi-thick coats, plus topcoat. I found it a little easier to apply in thicker coats because of the texture of the flakies. It all smoothed out well with topcoat. I have another wonderful guest post for you today! Isn't this so fun? Today's post is by Robin from Roaring Nails (formerly Rexxx Did It). I started following Robin's blog a few months ago. In fact, now that I think of it, I'm pretty sure I discovered her blog from a guest post. Hmm, what a coinkydink! Whenever one of her posts shows up on my newsfeed they are instantly recognizable. Her nail shapes are so unique and I love them! She always manages to come up with something different, and today is no exception! I'm Robin, a 22 year old girl from Belgium, and I run the blog Roaring Nails! When Emiline asked me if I wanted to be a part of her guest post series to celebrate her one year blogiversary, I was so honoured - her designs always amaze and inspire me (I even recreated one of her designs recently!) so I definitely wanted to guest post for her! I loooove this mani! I've been wearing it for three days now and I really need to take it off to do another one for the challenge. So sad. I really don't want to. I've probably looked at my nails 500 times since I did these. I didn't take photos, but even my right hand looks just as good! Okay, sorry, I'll stop gushing now. Hello lovelies! As part of my one year blogiversary celebration I have a series of awesome guest posts for the next couple of weeks by some talented bloggers . Are you as stoked as I am? This first post by Alison from ALIQUID starts off the series with a bang! ALIQUID is a nail focused blog with an extra flair of linquistics and miscellany. I always feel a tad bit wiser after visiting. In addition to the blog, Alison makes her own nail polish! I asked if she would share a little about her brand and I was thrilled to see her introduce three polishes from her new collection. Let's take a look! Hi everyone! This is Alison from ALIQUID! I’m really honored that Emiline asked me to do a guest post for her blogiversary—I’ve admired her nail art for a long time! I’ve been blogging about nail polish for over a year now, and last fall I decided to try my hand at making my own polish too. I now run the brand ALIQUID Lacquer. I think being a blogger has definitely given me an advantage at making indie polish, because I’ve already spent a lot of time thinking about polish finishes and color combinations! For today’s post, I decided to talk a little bit about how I created some of my newest polishes. I hope you’ll find it interesting! Unlike a lot of indie makers, who start by creating a polish and then thinking of a name for it afterwards, I usually start with an inspiration and then try to figure out how to express it in polish. I think the reason for this is that I’m not extremely creative! I like to have a familiar idea in mind first, and then see what colors and images it leaves in my head (does that make sense?). My latest collection takes its inspiration from my home state of Michigan, and especially from some of its most iconic spots. I’ll show you three polishes from this collection, first off in some nail art I did! I painted Michigan using ALIQUID Lacquer I’m Heading Strait to Mackinac as a base color and Yooper for the shape of the land. I added a matte topcoat on top. My other two nails are wearing Motor City. Hello everyone! A couple of weeks ago I suggested that some exciting things were up ahead. Well, today is a big day for me. It's my one year blogiversary!! Today's post is a reflection on this past year and the progress that I've made. Then tomorrow I'm turning the celebration up a notch with a HUGE giveaway! During the next couple weeks I have special posts planned, namely some awesome guest posts! So make sure to come back to join in the celebration and see what special treats I have in store. I was really looking forward to today's Challenge prompt! I just recently laid hands on the entire Sally Hansen Triple Shine Palm Beach Jellies collection. I kid you not, over the last couple of months I have searched for them in over a dozen stores. I finally found all but one at a Smith's grocery store (one I had previously searched). Then at Target yesterday I found they finally had a big display of them! The biggest reason I've wanted them is so that I could try out the leadlight technique, applying them over a stamped pattern. Of course I could always make my own sheer polishes by just adding clear polish to a regular one and mixing them. But I didn't really want to go through that extra work. Plus I don't have any polishes quite this sheer, so naturally I needed them in my collection! I don't have a huge stash of holographic polishes (I will someday..), but what I have I love. China Glaze I'm Not Lion had been on my wishlist for quite some time. I was so stoked when I finally got it! Today's Holographic prompt was a perfect opportunity to show it off again. Well it's only a week into the Oh Mon Deux 2 Challenge, and I'm already a few days behind! I knew I wouldn't be able to do every single prompt, but I want to do as many as I can. So you might see me posting some a little out of order (notice yesterday was my Day 6 post, and today is my Day 4). I was so excited to do this BRIGHT water marble, and I just love how it turned out! Today's OMD2 Challenge prompt is duochrome. I LOVE the way duochromes look in the bottle. They still look pretty cool once they're on the nail, but I'm always just slightly disappointed. For that reason, and for the fact that I have a hard time finding good ways to use them in nail art, I don't own many. The duochrome featured in this mani, Sephora by OPI Nifty Shades of Gray, is one of about five that I have. Since I've done a couple labor intensive nail art manicures recently, I went real low key with this one. Hello my Society Sisters! Who's ready for the three day weekend? Well if your nails are not ready for tomorrow's holiday, I'm here to help! I have 18 easy-to-do nail art ideas for the 4th of July. They work great for mix and matching, as an accent nail, or whatever your heart fancies! Read on for a breakdown of each look. Day two of the Oh Mon Dieu (part deux) challenge and I am LOVING this mani! The polish I used for the base color- piCture pOlish Ocean- is one of my very favorites! I'm so glad I have it because it fit in perfectly with my coral reef design. Isn't is so dreamy? I'm starting a new challenge this month- Oh Mon Dieu (part deux)! It's been a while since I've participated in a month-long challenge. I'm excited for the fun prompts and the cool nails that result from it! For those of you who have been tracking my blog's progress from the beginning (I like to imagine these people exist ;), you'll know that my one year blogiversary is this month. I have fun things planned for that, which will take up about half the month. So I won't be able to complete the entire challenge, but I'll join in when I can!